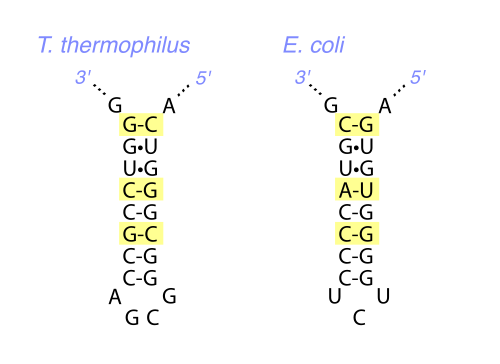 Ribosomal RNA sequences differ between species, due to mutation. Through variation in rRNA sequences we can distinguish organisms on approximately the species level and trace evolutionary relationships. Study of ribosomal RNA led to the definition of three separate “Domains” of life; Eukaryotes, Bacteria, and Archaea. It is now possible to sequence and analyze ribosomal RNAs without culturing the microbes that make them, providing a much more comprehensive window into the diversity of organisms present in the environment. The ribosome is an ancient and essential component of cellular organisms, and its form and function is consistent across the spectrum of living things. A key aspect of ribosomes and ribosomal RNAs is that their function is very highly “conserved”, or maintained by natural selection, between and among species. However, the molecules that make up the ribosome, including the ribosomal RNAs, differ subtly between species in their composition, due to differences (caused by mutation) in the sequences of the genes that encode them. For more detail on ribosomal RNA see here. Each component of the ribosome is, generally, extremely similar across all of life. However, the exact sequences of DNA that encode these components are not identical between organisms. DNA sequences can have more variety than the proteins they encode because the triplet codes for amino acids (see our DNA basics article) contain redundancies, and because the functions of proteins and RNAs in cells are related largely to how the molecules fold into three dimensional shapes. Slight differences in the DNA sequence encoding these molecules can arise without altering their shapes significantly, and thus without affecting their function. The end result is that, over evolutionary time, organisms very slowly accumulate changes in the sequences of the genes that encode parts of the ribosome. Any large, rapid change is unlikely to survive because the ribosome is so critical to all aspects of life and reproduction in an organism. The components of the ribosome are an excellent resource for studying the evolution of all organisms because all cellular organisms have ribosomes. The genes that encode the components of the ribosome originated in a common ancestor, and may be directly compared. We reason that the more closely related organisms are, the more similar to each other they will be in the DNA sequence of the genes that encode the ribosome, and use the gene variation both to identify organisms, and systematically derive their relationships to each other. This is analogous to comparing skeletons in vertebrates – the more closely related organisms are, the more similar their skeletons will be. The introduction of DNA-based studies made a tremendous impact on evolutionary biology. 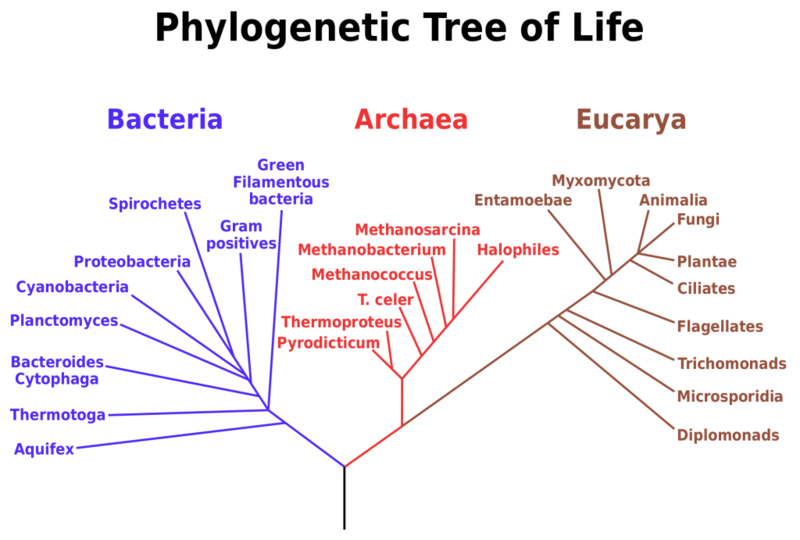 It changed the basic shape of our constructed “tree of life”, which, until the advent of sequencing, biologists had based on comparative morphology. For most of the last 150 years, biologists divided organisms into two main groups. The eukaryotes had their DNA contained within a special membrane bound compartment (known as the nucleus). Any organism without a nucleus was known as a prokaryote (bacteria, mostly). 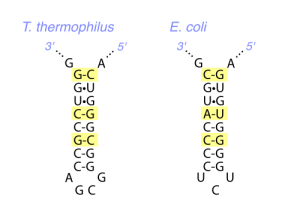 However, in the 1970s Carl Woese began studying the evolution of organisms by comparing the sequences of their ribosomal RNA. At the time, it was difficult to read the sequence of the region of the DNA that encoded the ribosomal RNA, but it was possible (though still hard) to read bits and pieces of the sequence of the RNA molecules themselves. He started sequencing ribosomal RNA from a diversity of organisms, and found a striking result: the organisms lumped together into the prokaryotes formed two distinct and ancient groups. One corresponded to the standard bacteria many people were familiar with. The other defined a collection of highly unusual and little studied organisms. Very soon after Woese and colleagues outlined the three domains of life, researchers started reading the sequences of ribosomal RNA genes from a larger number of organisms. Researchers studying microbes initially focused on microbes that they could grow in the lab (i.e., the cultured species) because it was easy to obtain large quantities of pure ribosomal RNA from cultured organisms. However, a few researchers, especially Norman Pace, realized that they might be able to use this general approach to study microbes in the environment without ever growing them in the lab. Pace sampled environments where there were thought to be only a few types of organisms present, isolated ribosomal RNA from the samples, and read the sequences. He showed that he could determine the types of organisms present in a sample by building evolutionary trees of rRNA sequences, even if he had never grown, or even seen, the organisms. His work launched the field of environmental RNA/DNA surveys. For basic background on DNA, RNA, protein and the ribosome go here. For details on ribosomal RNA (rDNA) go here. This document was produced by microBEnet. It was written by Jonathan Eisen and edited by David Coil and Elizabeth Lester with feedback from Hal Levin. Cell types figure from Wikipedia Commons, rRNA figure from Wikipedia Commons, Tree of life figure from Wikipedia Commons.